Creating content that people actually like and share takes a lot of work in digital marketing. Coming up with the idea is only half of the battle. Writing the content takes a lot of time. Here, you learn a few methods of creating high-quality content, very quickly. The link roundup post involves curating information from multiple sources and pulling it all together into one article. The content you aggregate does not have to be produced by you or your organization. The link roundup works well as a list post because it is a very easy and effective way to present the content. For instance, a food blogger might go out and find, or aggregate, guacamole recipes for an article. All the recipes don’t have to be the blogger’s personal recipes but can be pulled from around the web. The author then lists each recipe, states why the recipe is worthwhile, and attributes and links to the source. 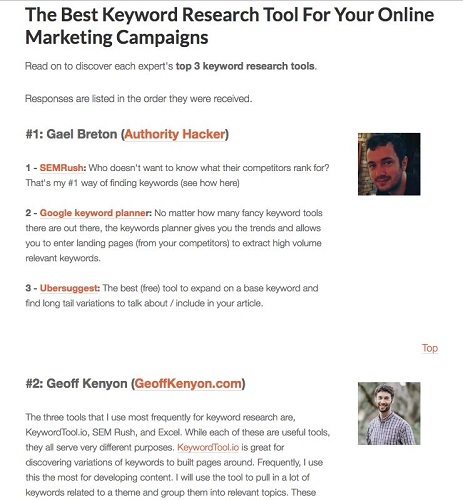 The advantage of the link roundup is that you don’t have to create the content yourself. None of the guacamole recipes you use have to be yours. You can therefore post much quicker than if you had to create all the content yourself. Also, readers appreciate that you’ve done the research and the work for them and gathered all those recipes in one place on your blog. 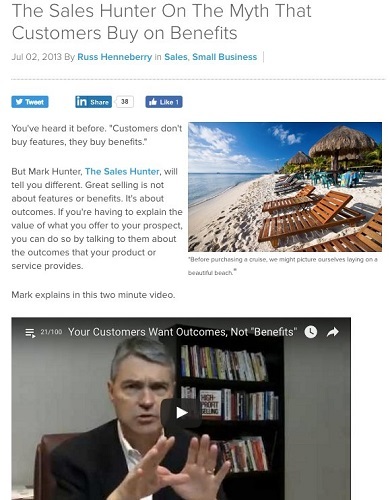 An article like this may serve as a resource for readers to return to, so they bookmark your content and continually return to you. Although you can produce the link roundup post quickly and create goodwill with your readers, a challenge on your end is finding quality outside content that doesn’t reflect poorly on your brand. Typically, link roundup posts are not text heavy. They provide brief descriptions that introduce the post you reference before you link to it. Even if the post has little text, it should have big, beautiful pictures for a visually engaging post. You can acquire the images from the article you link to. This image shows a link roundup blog post. 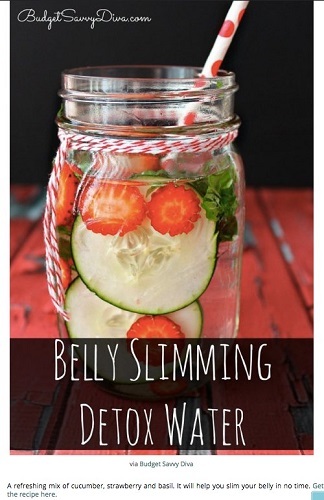 An excerpt of a link roundup of detox water recipes from DIY Ready. The embed reaction post type is one of the fastest ways to produce high-quality blog content. websites like YouTube and SlideShare provide a piece of code that allows you to embed a piece of content on your own website. The embed reaction post begins with locating a popular piece of content that you can embed on your blog. A sample of an embed reactor blog post from Salesforce.com. You can embed one piece or multiple pieces of content, depending on the complexity of the topic. The more popular the piece of content you embed is, the more likely it is that your audience will engage with and share your post. You can determine the popularity of the piece of content by looking at things like the number of views or number of times it has been shared. After you have found relevant and engaging content to embed, you react to the content in the body of the post. In your reaction, you can agree or disagree with the embedded piece, much as you would in an op-ed article, or you can expand upon the content. How much text you need for the embed reactor post will vary depending on the complexity of the topic and how long it takes to explain your reaction. Of course, you want to ensure that the content you embed is of high quality and fits your brand. But as with the link roundup post, you don’t have to create all the content yourself, which is a major time saver. When you’re looking for content to embed, YouTube is an obvious choice, but many other places offer quality content for this post type. For instance, visit Visual.ly for professional infographics that you can share, or SlideShare for presentations and documents that make for stellar embed reactor content. The crowdsourced post is another fast and engaging article to put together. In this post, you gather three or more experts and have them answer the same question. You then combine the answers into a single post: the crowdsourced post. You’re sourcing the crowd for answers and bringing them all together. For example, your post might be about social media tools. You can reach out to professionals and ask them to answer what their favorite social media tool is and briefly describe why. Then succinctly introduce the post and state the question you asked before stating each expert’s answer. This approach makes for a very rich post because you’re pulling in many different responses and insights that provide value for your readers. Source the highest-profile experts you can or simply include colleagues you want to be featured with. Display answers from people who both understand your industry and can provide a solid answer to your question. Chances are, your friends or colleagues can answer this question or know someone who can; reach out to them. Another great aspect of the crowdsource post is its likelihood to be distributed. The experts you include in the article have an incentive to share the article with their audience, which in turn helps you expand your audience base. With that in mind, make sure that those featured in the article know when it’s published to increase the chance that they’ll share the post. When you reach out to experts, don’t ask just one question; ask several questions. For instance, if you email ten experts in your market five different questions and each expert responds, you have the makings of five different crowdsource articles. The number of questions you ask is equal to the number of posts that you’ll get and the number of times the expert will be exposed to your audience, making this mutually beneficial for you both. Here is an example of a crowdsourced post. A crowdsourced post from robbierichards.com.